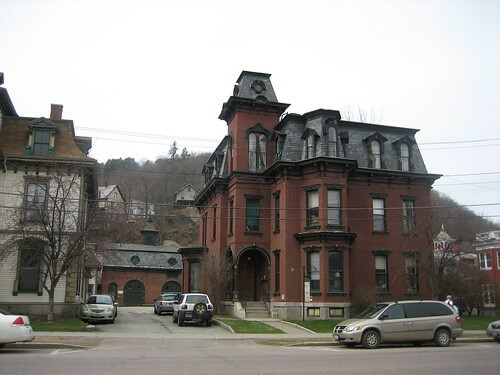 So I’m back from my little informal writing retreat with my friend Camille Alexa in Montpelier, Vermont, which is not only the capital of that state but also the capital of Picturesque. I wish I had taken more photos, actually — long streets full of Victorian Painted Ladies and pretty old brick buildings. Even their old jail (now offices) is quaint, and you should see the fire station. A lot of my strolls were in the evening, though — not the best time to get architectural snapshots. Took a walk every day around the burg, toasted my feet in front of a wood stove, had some awesome meals and got a lot of writing and revising done. I’m back into a big project I’d set aside and I hope to maintain my forward momentum! On the way back, my flight into Chicago was delayed so I missed my connection and had to stay overnight — so special thanks to EMeta for buyin’ me some Chicago deep-dish pizza. I believe the technical term is “NOM NOM NOM”. P.S. A story from Camille’s upcoming collection went live at Fantasy Magazine right before I left for VT. Everyone loves “Shades of White and Road” so why wouldn’t you? Don’t you just love the adorable little capital building? We were there on our “big east” tour back in ’91 and I still remember how darn cute it was.